0 bands and 152 residues. 0 means distance is in range (-Inf,2). 1 means distance is in range [2,4). 2 means distance is in range [4,6). 3 means distance is in range [6,8). 4 means distance is in range [8,10). 5 means distance is in range [10,15). 6 means distance is in range [15,20). 7 means distance is in range [20,30). 8 means distance is in range [30,50). 9 means distance is in range [50,Inf). for the Ca-Ca pairs 35-36 and 58-121 respectively. so it can be included in a snapshot of the protein when a puzzle ends. Below is a sample snapshot made right after the DistMap0 run above. You can click on the below image for a more detailed view. Distance and Contact Maps show the protein in a way that does not depend on the protein's orientation in 3D space. If two structures for the same protein look different in 3D, it could be (1) because they are identical structures viewed from different directions or (2) because they are truly different structures. Looking at their Distance or Contact Maps can tell if the two structures are actually the same or truly different. p.247 of the book "Proteins: Structures and Molecular Properties"
that look very similar to each other. 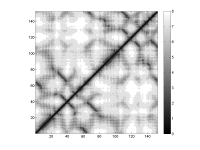 Below is a Matlab image made from the full Distance Map made by the DistMap0 run above. map and the Contact Map shown above. Click on the image below for more detail. It would be neat if we could use html code within the Recipe Output window. to make the above distance maps. please post here or at http://fold.it/portal/node/2001554 about it.